SCVHistory.com | Pico Canyon | Did Andres Pico Really Harvest Oil in the 1850s? Did Andres Pico Really Harvest Oil in the 1850s? SCVHistory.com | November 17, 2014. The first article below is from the Daily Alta California of Feb. 21, 1865. The second article is from the Sacramento Daily Union of March 31, 1865. Andreas Pico knew the locality now called Pico Canyon, Los Angeles County, for some years before Mr. Morrell established his refinery , and had made oil for the San Fernando Mission in a small way, in a copper still and worm. He was probably the pioneer coal oil manufacturer of the State. This statement seems to be the source for every future history book. Between 1894 and 2011, almost all books I have checked have more or less the same Pico story with different embellishments. Most start out with "it is said that" or "there is a legend" — nothing very certain. 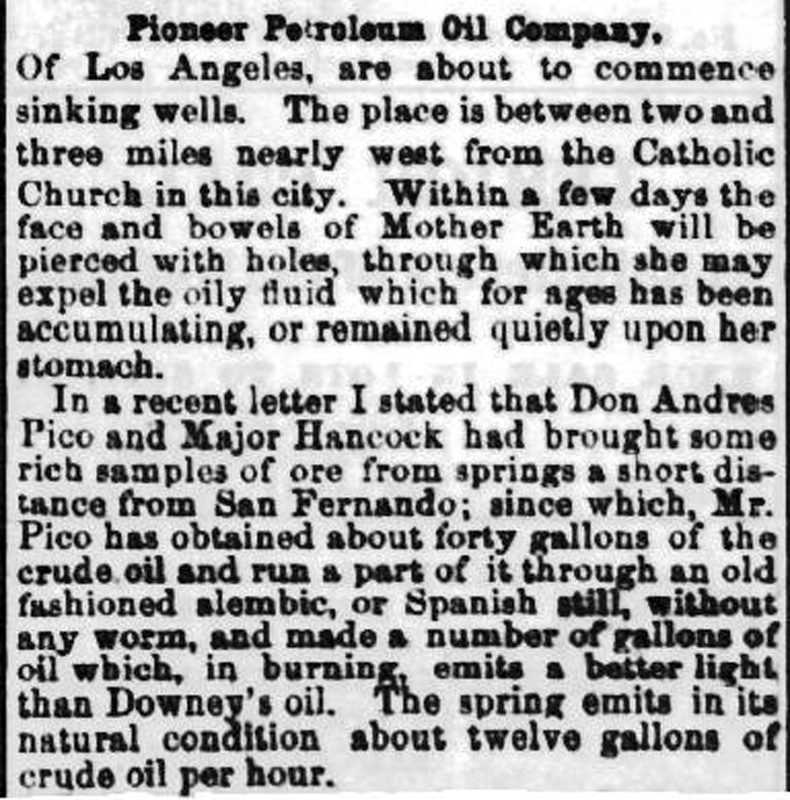 The only evidence that Andres Pico ever refined oil for the San Fernando Mission comes from William W. Jenkins who writes in the "History of the Development of Placer Mining in California" (from Annual Publication of the Historical Society of Southern California, Volume VII, 1906, p. 71) that "in 1854 W.W. Jenkins and Sanford Lyon, at the instance of and with Francisco Lopez, visited the oil springs, from whence the Mission San Fernando took the oil in rawhide bags to the mission where it was distilled for lighting purposes." However, Jenkins was 70 years old when he wrote this, more than 50 years after it (may have) happened. I have found no contemporary account of oil being refined (or distilled) at the mission and used for light. Considering the uniqueness of using oil for light at that time, I find this surprising. There were many descriptions of the life at the San Fernando Mission in the 1850s. For example, J.E. Pleasants spent a week at the mission in 1856 as a boy and wrote a 13-page description of his stay there. He said nothing about oil. The mission was well known for refining wine and olive oil in stills, but no one in the 1850s wrote anything about refining petroleum. "There is a claim that Andres Pico distilled petroleum into illuminating oil at Mission San Fernando as early as 1854-55. Extensive research into the beginnings the oil industry in California does not confirm this story, and it seems best to consign it to the realm of folklore." Daily Alta California | February 21, 1865. ... of Los Angeles, are about to commence sinking wells. The place is between two and three miles nearly west from the Catholic Church in this city. Within a few days the face and bowels of Mother Earth will be pierced with holes, through which she may expel the oily fluid which for ages has been accumulating, or remained quietly upon her stomach. In a recent letter I stated that Don Andres Pico and Major Hancock had brought some rich samples of ore from springs a short distance from the San Fernando; since which, Mr. Pico has obtained about forty gallons of the crude oil and run a part of it through an old fashioned alembic, or Spanish still, without any worm, and made a number of gallons of oil which, in burning, emits a better light than Downey’s oil. The spring emits in its natural condition about twelve gallons of crude oil per hour. Sacramento Daily Union | March 31, 1865. Parties here in town have had a small miniature still made for the purpose of trying experiments. 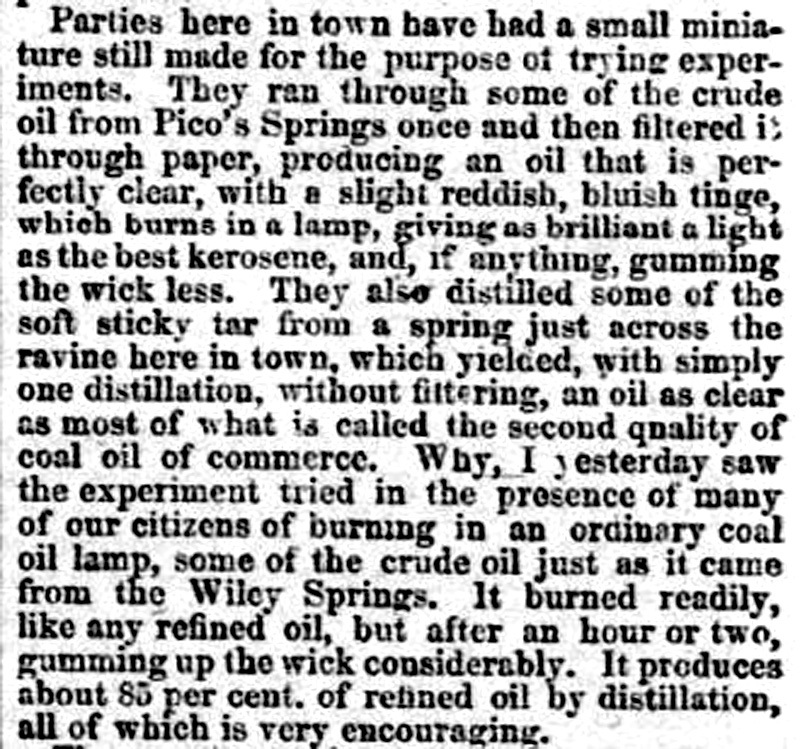 They ran through some of the crude oil from Pico’s Springs once and then filtered it through paper, producing an oil that is perfectly clear, with a slight reddish, bluish tinge, which burns in a lamp, giving as brilliant a light as the best kerosene, and, if anything, gumming the wick less. They also distilled some of the soft sticky tar from a spring just across the ravine here in town, which yielded, with simply one distillation, without filtering, an oil as clear as most of what is called the second quality of coal oil of commerce. Why, I yesterday saw the experiment tried in the presence of many of our citizens of burning in an ordinary coal oil lamp, some of the crude oil just as it came from the Wiley Springs. It burned readily, like any refined oil, but after an hour or two, gumming up the wick considerably. It produces about 85 per cent. of refined oil by distillation, all of which is very encouraging.